Best Weighted Vest Reviews In 2019 - Enhance Your Workouts Now! Best Weighted Vest Options You Can Buy To Challenge Yourself! For those who want to step up their weight training regimen, in general, the easiest and most inexpensive way to do so is to incorporate the use of a weighted vest. Weight vests comes in various shapes and sizes. Some even look like a life jacket or Army gear but are extremely effective! You will find out which is the best weighted vest to use for your workouts below. So, let's move on to our weighted vest reviews and get rocking! Out of the 10 weighted vests on this page, Cross 101 is my favorite. It's the most versatile since it goes up to 40 lbs. I can use it for runs, squats, lunges and jumps. It's truly a 5 star vest. The weight is placed within the vest whether via sand or another material to create a heavier vest. In return, there is more weight distributed along the front and back of the user’s torso to create resistance during their training. Wearing weights, rather than carrying, them is an innovative way of improving your work out, weight loss or exercise regime by making you work harder. Some have been designed for vigorous workouts like running by fitting tightly to the body ensuring little movement and are padded. Others are for building up strength in the muscles and endurance. It's my goal to give you a top rated list of weight vests below to choose from that will fit the type of workout you will need for or train goal. Let's get rocking below! Stretching material that fits snug on your body and is washable! There are three options for the weight increments for this vest, allowing most beginner and intermediates to begin wearing this with ease. Weight increments include .5lb increments, 1lb increments, and finally – 2lb increments. An option as such allows you to work at your pace. The flex weight design allows for maximum mobility, just like the compact design. Easy to wash and easy to dry, you can get rugged and rough without worries in the HumanX training vest. 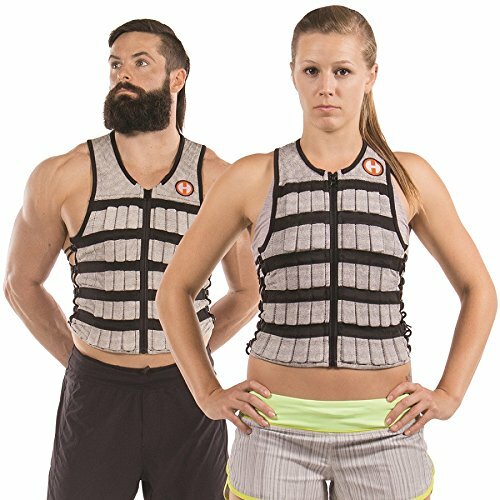 What is really unique about this vest is that you have 3 options to buy this vest in so you can dial in the exact type of weight adjustments you are looking to have in your workouts. So, the 10lb model has 0.5lb increments. The 20 pound model has 1lb increments and the 40 pound model has increments of 2lbs each. Pretty dang sweet if you ask me. So, buy the Humanx model that fits your weighted training goals for your workout! One of my personal favorites, the Hyper Vest® PRO, is super flexible and fantastic in design for both men and women. 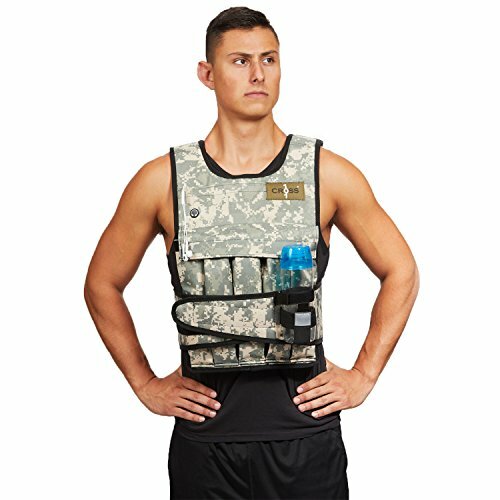 Those who have smaller upper bodies (or slightly larger) will enjoy the comfortability and the style of this weight loading vest. Perfect weighted vest for running! As I mentioned, the Hyperwear Hyper Vest PRO Unisex 10-pound is one of my favorites due to its adjustability and it's full range of motion capability when exercising. Whether you’re bulking up or you don’t have a small torso, the ability to give slack with lace and the stretch fabric make it easy to find yourself the proper fit. Let’s also talk about kicking the “one size fits all” mentality, especially when it comes to fitness! The range of sizes for this product is pretty versatile compared to 90% of its competitors. While the lace side is great for sizing, it’s also fabulous for ventilation (which we all need, inevitably when it comes to working out). The 10lbs. of weight is also included, and is composed of high-density, durable steel for longevity! This is very popular among crossfitters because he adds extra weight but conforms to your body and does not get in the way. Also another great one for runners or sprinters. The one issue with this vest is that if you’re looking for something for heavier weight training or something specifically for upper body training, you won’t be going to the Hyperwear Hyper Vest PRO Unisex 10-pound vest for answers. However, if you’re searching for an upper body model, you probably wouldn’t come across this one anyway. All in all, I HIGHLY recommend this for maximum versatility and comfort during weight training (especially for beginners!). Given tight fix and flexibility fit it's a great weighted vest for crossfit athletes who want extra weight while training that won't get in their way. 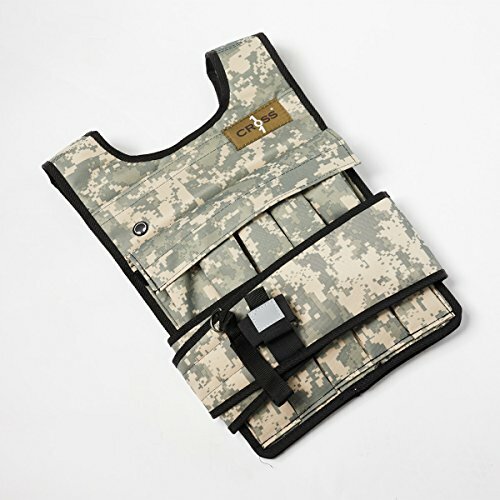 This is now one of the best selling weighted vests on the market. There is a variety of weight options that you can buy which come in 12, 20, 40, 50 and 60 pound vests. The pro model comes with a phone pocket which I personally like. I carry my iphone and wireless head phones around working out all the time. I end up moving the dang phone all the time during the workout so I stay close to it. So, have a pocket to store it in my eyes is a big plus. It does have a water bottle holder too which would be fine walking with. I can't see myself using it jumping or running though. When you order this vest you will have the options to select shoulder pads or not. For the heavier vests I would consider it. Couple notes about it. You secure the vest by a large veclro belt which is easily adjusted to your waist and chest for a snug fit. The removalble weights are made out of sand which tend to conform to your body and don't move around when running. It could run with it, but it is bit large on women. So, if you are looking for a light conforming vest then I would look at another model. Works great for walking and resistance exercises. Whether you’re male or female, you may have a smaller torso or a shorter average height. Because of this, you may find it hard to find one that goes well with your body type. Thankfully, the Tone Fitness weighted vest may be the solution for you. With an abundance of features, a great price and a highly-rated overall product, the Tone Fitness vest is perfect for those that aren’t on the bulkier side. One of the most admirable features of this Tone Fitness vest is not the mp3 or smartphone pocket; it’s actually the neoprene material. Weaved in for comfortability and breathability, the neoprene material allows you to be the most flexible during your workout. Beyond this, there is a reflective strip installed so that you can work out at night, anywhere you want, without the fear of being hit or run over. For those who want to get in some resistance training during the night like running, this is the perfect vest for you. As mentioned, this vest is ideal for beginners and the 12lb. vest limit is proof of that. A lot of beginners start out with something as small as 8 pounds or 10 pounds, but the 12-pound feature is fantastic for those who are new but want to use something a little heavier for a while without hurting themselves. The only disadvantage to using the tone weighted vest is the fact that you can’t change the amount of weight within the vest. However, those looking for something solid and reliable for a while will love this inexpensive option. Overall, this is one I’d highly recommend and have used when I first started my weight training. Weights are made out of sand stored in flexible plastic. Most vests do not allow you to adjust them which can be an issue to get a snug fit. Not with this one! Whether narrow or wide, you can enjoy this adjustable camouflage weight training dream. The reason for the lifetime warranty behind one of the best-weighted vests on the market is that it passed the Wildland Firefighter pack test training. In completing this successfully, you can expect this to be one of the most durable models you can buy. Back support is crucial during any fitness program, but especially for weighted training. The incorporation of better back support with this type of vest is imperative for optimal safety and a huge benefit. You may find it odd and a disadvantage that this vest doesn’t hold up to 50lbs., as the maximum is 45lbs., but it’s not so far off and presents a comfortable resting point weight-wise. Regardless, this is one vest that’ll last you a lifetime and is highly worth the purchase. So, highlighting the main benefits is that I love how weights are designed so it conforms your body, they are very secure and say out of the way doing exercises. There is a lot of shoulder room in this vest. You can adjust the shoulder straps and belt to fit really snug. This is a huge deal because you can do a normal workout like you would without it. Yes, this vest may be styled like a bulletproof vest, but that just means it’s endearing quality is the fact that it’s super reliable! 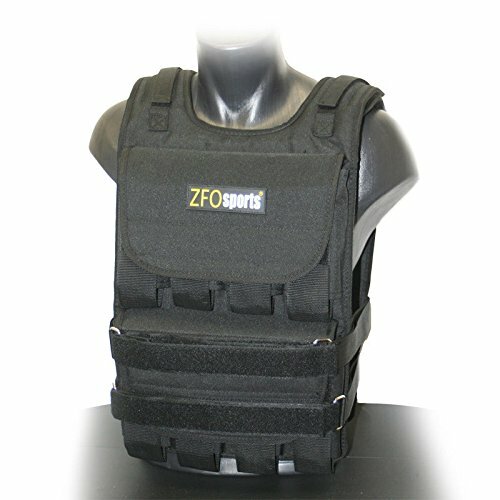 The ZFOsports is one of the toughest weighted vests on the market and super durable. 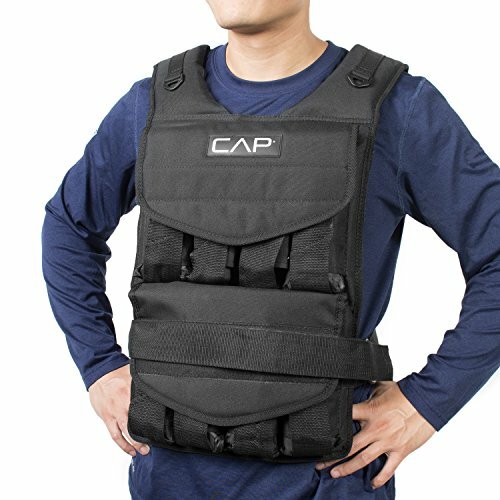 Let’s dip into the weight aspect of this adjustable vest as it’s one of the most attractive features (or set of features) and the most imperative. With a 80lb. maximum weight for this vest, it also comes with the option to adjust the weight as well. Beyond this, the weight is included with the vest and you don’t have to go out and buy 80lbs of weights to use in your training. One of the primary advantages of buying this vest, everything is included – including comfort! The adjustable straps of this allow it to be a “one size fits all” situation and is fantastic for longer torsos. The only disadvantage of the ZFOsports adjustable version is that it is rather bulky, but for those who are looking for a heavier vest, this is to counter sliding and something you don’t have to worry about during rigorous activity. Based on my personal experience as well as the price, I’d have to say; this is great for medium to more intensive workout regimens and one I’d highly recommend. 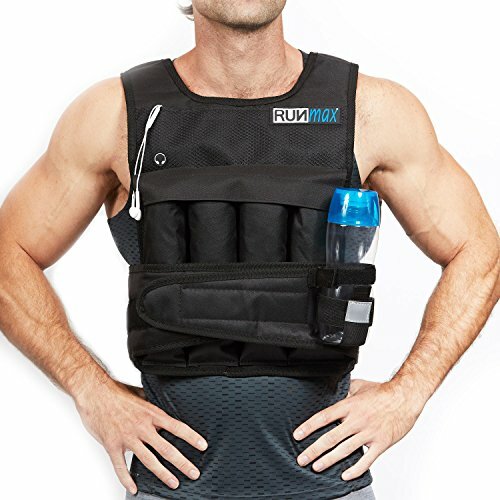 This is a very light weight vest that can be used for a multitude of exercises. It is made out of neoprene and has a belt strap that locks around the weights. This is really ideal for people wanting to add extra weight running or walking. You literally can use this for any activity because of how light weight it is and how open the shoulder and strap area are. It is also very low priced as well. 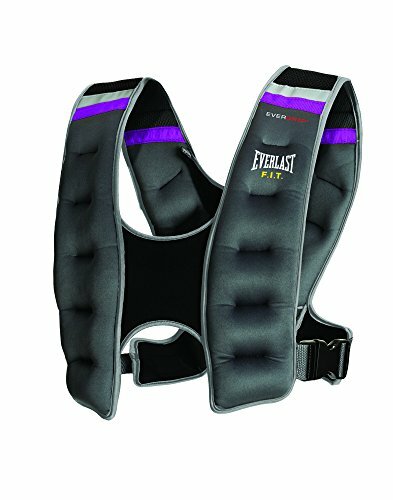 Since it's from Everlast it means that it was originally designed for boxers to wear during their training to give them extra weight and resistance. This is also for people who want a little extra weight for walking to help with weight loss. There are panels inside that are textured that allow it to stick to your skin and keep it in place which is pretty nice. I will mention that if you have really wide shoulders or a bigger chested person this could run too small for you. Styled after football gear, the MIR short style weight vest was designed for those who want to work on their upper body strength while completing their overall workout regimen. For those who participate in cardio, intensive work out that want to pinpoint certain areas of their body; this vest is all the rage. For medium to heavy workouts, the MIR workout plate vest is very convenient. Working out the front “plate” of your body is crucial, but often accidentally ignored. With the incorporation of the cross strap to keep the plate secure, you won’t have to worry about the plate vest sliding around during your intense workouts. The same goes for the Velcro belt and the D-Nylon straps which aid in creating a comfortable and safe experience with your weight plates. As for the weight aspect of this vest, you can put any number of weights equal to upwards of 60lbs. You decide how much you want to take on and the control of this vest is fantastic. One of the only disadvantages is that the weight doesn’t come with the vest. However, this allows you to purchase the exact amount of weight (up to 60lbs.) that you wish to include. Those who aren’t ready for something as heavy as 60lbs. will see this as a blessing in disguise and workout with their desired weight. For those targeting upper body strength and conditioning, I would highly recommend this for purchasing. Whether you were in the army, currently are, or never were, you can train as you did or how you want with the Cross 101 Adjustable Vest. Perfect in length for both short and tall users (as well as male or female), the flexible Cross 101 has it all. Vest Models rang from 20 to 100lbs. The versatility in how you install additional weight is much better than competitor vests, as you don’t have to go up in increments as low as .5 or 2lbs. like some. With a 4lb. Increment for weight adjusting, you can train at one set for a long time and then add in another weight that will last you equally as long. The maximum of this vest is 40lbs. and features Iron Ore weights – providing strength, durability, and reliability. A one-piece Velcro belt design is wide and keeps the vest and weights in place. A one size fits all vest; the length is perfect for both short and long torsos. A disadvantage of the Cross 101 is that it may dig into your shoulders if you’re a bit bonier than others. While this hasn’t been an issue for me personally, this also has to do with the weight distribution on your ends, as well as your workout gear. A slight issue with self-resolution, this is still worth the purchase. 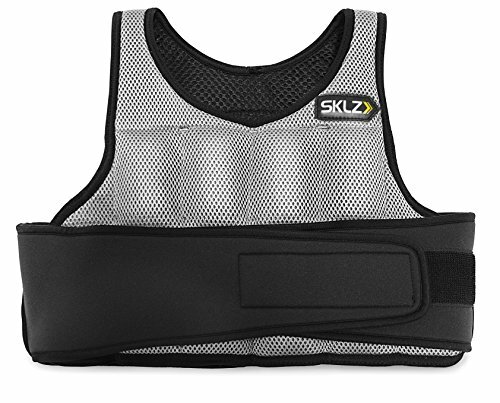 A vest that’s great for upper body strength training during workouts, the SKLZ Workout vest is one of the best on the market due to its materials alone. The overall design of the SKLZ vest is worth the purchase alone, as the reinforced nylon and mesh design allow for maximum comfort and breathability during sweaty and intense workouts. As for the “weights digging in” issue that other vests have, the soft bound edges of this vest prove to be a clear winner. Providing maximum comfort, the stretch pockets of this vest allow for easy weight adding or removing. 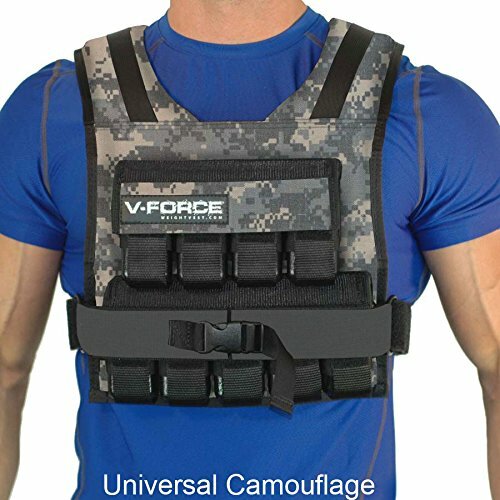 As for the Velcro belt, you won’t have to worry about trying to adjust with weird and complicated plastic straps, as the high-quality material will not only secure the vest to your torso for minimal moving around, it’s also extremely easy. Lastly, this vest includes the weights, which is a maximum of 10lbs. The only disadvantage to this vest is the low capacity for weight. While this design is great, it’s meant for lighter workouts and those who aren’t looking for something extremely heavy. However, if you’re in the market for a 10lb. max vest or for something light, you’ll want to buy the SKLZ for sure. Are you someone that doesn’t work out super intense but wants to up their fitness game? 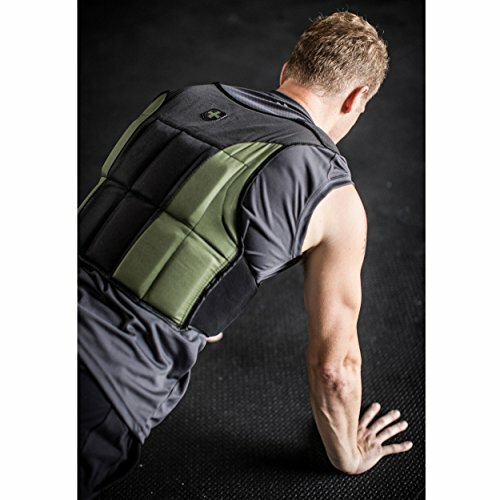 Or maybe you’re someone with a smaller upper body that wants to work on perfecting and bulking or you are looking for a weighted vest for crossfit .... If so, the BOX Super Short Weight Vest is for you. Being easy to clean, we have the nylon Cordura to thank for this. Not only is this material seriously comfortable, but it’s easy to clean – which can’t be said for many of its competitors. 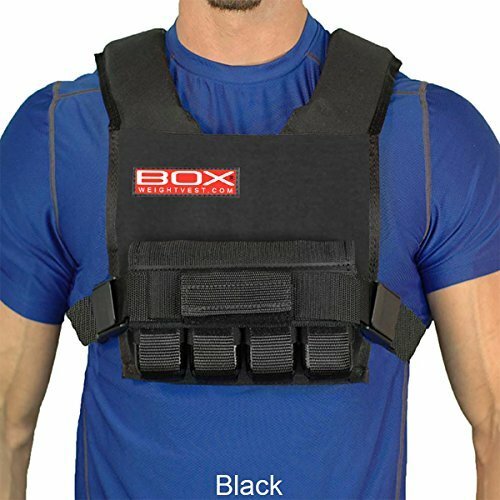 The composition of weights and where it rests on the upper body makes it a great weight vest for those who partake in rigorous cardio like CrossFit or super intensive workout regimens. You also don’t have to worry about this vest digging into your shoulders or underneath the vest as it comes fully padded for optimal comfort. Lastly, the weights included come in 2.5lb. Increments that are entirely removable. You set the bar for how much weight you want to carry and when. The only disadvantage I found of this vest is that most of the weight is towards the center of the upper body, rather than all the way towards the shoulders. However, this is perfect for having more mobility during your workout, which is fantastic for those who do partake in CrossFit like activities. Overall, I highly recommend this BOX product. Simple in design and features, there isn’t much to say other than speaking of its performance. Much different and more durable than any other product I’ve personally reviewed and tried, the weight range of the CAP Barbell is meant for serious weight trainers only. With a minimum weight capability of 40lbs., an a maximum weight of 150lbs. Naturally, there are large and durable straps to help keep this vest on and contouring your body, so it doesn’t slide around during usage. The full torso design allows bulkier, larger torsos to enjoy every aspect of this. The only qualm with this vest is that if you’re looking for something that holds a smaller amount of weight, you won’t find it with this vest. Although, you probably won’t come across this one naturally anyway in your search because of the weight increments. As someone who was once a beginner and is now a more advanced weight training enthusiast, this is my go-to and one I’d highly recommend. So, take note of the weight range of this one. This is specifically designed for people who really need a heavy weight to workout with. Firefighters this is a great one to use to help get used to all the gear you wear during drills. Anyone preparing for basic training or long marches, this is a great option for you. Lastly, anyone who wants to really add heavy weight doing body weight exercises this Weighted Vest would fit your workouts as well. In this post we are going to give you a brief overview of three things that you need to consider if you are looking to buy the best vest and we will run through the three most pressing concerns that people have. The first thing that you need to consider when you are picking a weighted jacket is what you will be using it for and obviously you will be using it for resistance with your workout to challenge yourself with the extra weights. You might want a weighted vest for running to challenge your runs. So, you need to make sure that you get one that will suit you depending on the activity that you are doing. If you are looking for a weighted vest for crossfit, then you want to make sure it fits snug and will not interfere with your exercises. Some of you advanced cross-fitters will also want the extra option to adjust the weight. So, make sure you pick the weight you need for your workouts. If you are running and you get a bulky model that is to have a you quite often find that you get brilliant results but it is not very comfortable and it can rub on your shoulders or your neck. Likewise, if you are doing weights and you find that you get a lightweight vest you may find the resistance is not very good so you need to make sure that you consider some of these choices. The second choice is that you need to make sure that any weighted jacket you get is adjustable or goes up to the weight you will need to complete your workout. Some of these will go all the way up to 60 pounds in weight. They range from adding 2.5 lbs to 4lbs at once. The last thing that you want is something that you cannot just and then be stuck with a very hard work out every time you use it. You also need to think about where the weights going and that they are evenly distributed between the front and the back so when you go to take some weight off you are not lopsided. Most of them that we have reviewed on this website are adjustable and you will find them super easy to use. So, this shouldn't be a problem. The Price of the Vests. 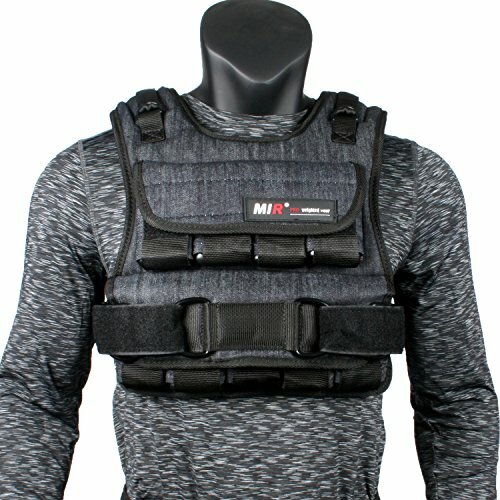 The last thing to consider is of course the price and we have put together the reviews so you can see exactly what to expect and where to get the best prices we have also advised on the best weighted vests to use for weight training or running and we are confident that if you view our choices you will find something that you can use!